Finalists from L to R: Frankie Harrer (1st), Vahine Fierro (2nd), Brisa Hennessy (4th) and Mahina Maeda (3rd). Pipeline, Oahu, HAWAII – (Thursday, March 23, 2017) — The coveted Pipe lineup was dedicated solely to the women today for the World Surf League (WSL) Wahine Pipe Pro and saw Malibu’s Frankie Harrer (DEU) rule the peeling 4-6ft. surf with big wave competitor and Pipeline charger Makua Rothman (HAW) as her mentor. 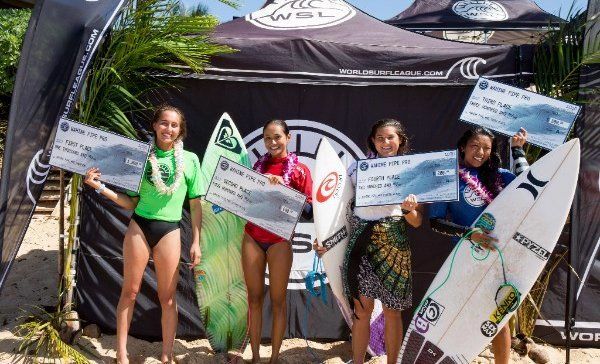 Tahitian Runner Up Vahine Fierro (PYF) claimed her third Final berth in seven days after today’s performance, last week’s win at the Papara Pro Vahine Open and a second place finish in the Pro Junior division in Tahiti, while last year’s Wahine Pipe Pro winner Mahina Maeda (HAW) took third place and Oahu powerhouse Brisa Hennessy (HAW) took fourth. This is Harrer’s maiden QS win and rightfully so, as she charged through the Pipe barrels with confidence and scored the best wave of the event in the Quarterfinals, a 9.25 for a proper Pipe barrel on her forehand. “There were so many sets I was pretty psyched,” said Harrer, 19. “I just like dropped into it and got a little barrel.” Her combined heat total for Quarterfinal 3 was 17.55, the highest of the event, and she continued to impress judges and the beach crowd with her fearless commitment all the way through the Final. 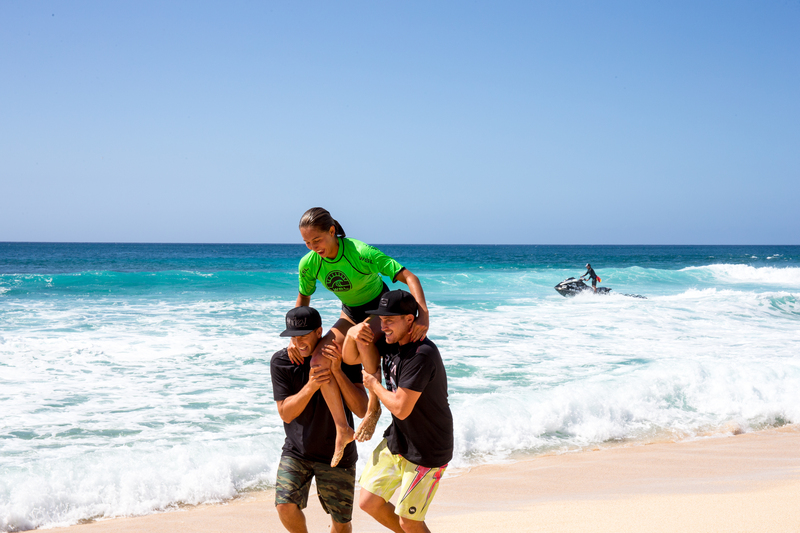 But one of the boys was there to help elevate her to the podium; Makua Rothman (HAW), Big Wave World Champion and Pipeline specialist, offered critical insight throughout each round. Rothman cheered her on from the Volcom house all the way through the Final, when the surf went uncharacteristically quiet. But competitors were hopeful as lines appeared on the horizon and whistles pierced the air from coaches and excited onlookers. Fierro and Maeda traded waves in the first half of the heat while Harrer and Hennessy shared neutral priority and waited patiently to attack. Finally, the best set of the 30-minute heat arrived and Frankie was in perfect positioning to drop in. She pulled into a left-reeling barrel then slashed one off the top for a 7.0, which propelled her to first place. French Polynesia’s Fierro is on a Finals streak this week and will continue her competitive campaign in Portugal for a QS and Pro Junior event at the Caparica Pro in April. She spent the last six days on Oahu fine-tuning her skill and strategy at Pipeline, which paid off tremendously. World-famous surfer and wildcard Bethany Hamilton (HAW) reiterated this sentiment despite missing out on advancement by 0.25 points in Round 1. Happy to surf Pipe with just the girls, Hamilton competed for the first time this year and went against Hennessy and Aloha Lopez (HAW) in a 25-minute heat filled with power-packed sets.